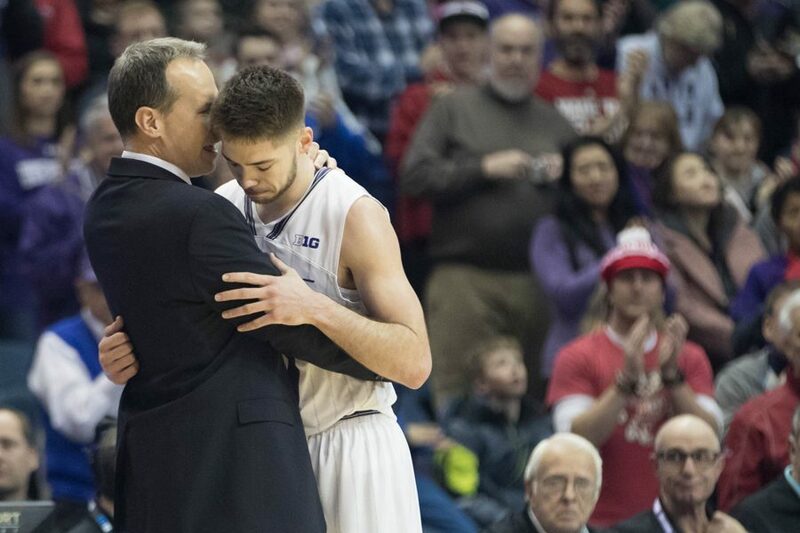 Chris Collins and Bryant McIntosh hug each other after the senior guard subbed out of his final home game. McIntosh had 18 points in the Wildcats’ loss on Senior Night. Bryant McIntosh may have missed the previous two games, but nothing was keeping him out on his senior night. McIntosh has been the main catalyst for Northwestern’s (15-15, 6-11 Big Ten) offense for almost two full years now, including the program-changing 2016-17 season. Thursday, he got one last chance in front of home crowd — and he didn’t disappoint, posting 18 points, dropping six dimes and reviving the Wildcats’ offense that looked out of sorts without him. It wasn’t enough for NU, which fell 70-64 against Wisconsin (14-16, 7-10). With only one regular season game before the Big Ten Tournament starts next week, the senior guard knows that his days are numbered. McIntosh was joined atop the scoresheet by his backcourt mate, fellow senior Scottie Lindsey. Lindsey came out hot, making four of his first five shots, and finishing with a game-high 26 points while shooting 8-for-16 from the field and making eight of his nine free throws. Those 26 points tied a season high for Lindsey, and it was the first time all season that he attempted a minimum of 15 shots while shooting at least 50 percent from the field. The senior backcourt combined for 69 percent of the Cats’ points on the night while taking 70 percent of the team’s field goal attempts and over half its free throws. It was a vintage performance from two players who coach Chris Collins said were crucial to the transformation of the program.